Tim Burton‘s return to stop-motion, Frankenweenie, hits theaters on October 5. The film is based on a live-action short that Burton made quite a while ago, and centers on a young boy who reanimates his deceased dog. The pic has received some rather glowing reviews, with our own Matt Goldberg calling it a return to form for Burton that rediscovers “the fun and warmth that used to be intertwined into his visuals and tone.” Read his full review right here. Disney has released six clips from the film as well as the pic’s “12:01 IMAX Poster,” which will be given out to fans who attend Frankenweenie midnight IMAX screenings. The limited edition poster is actually pretty great and features an original sketch by Burton himself. 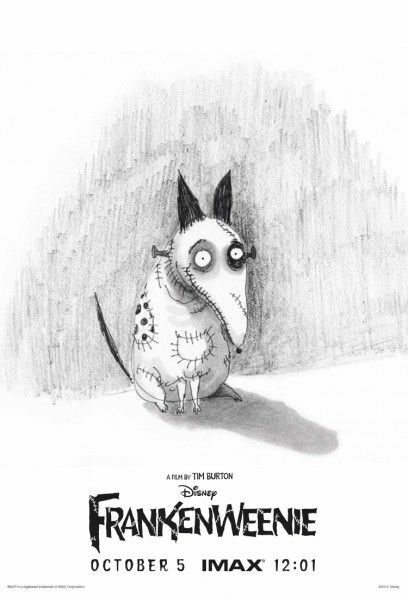 Frankenweenie features the voices of Charlie Tahan, Winona Rider, Martin Short, Martin Landau, Christopher Lee and Catherine O’Hara. Watch the clips and check out the poster after the jump.